Part 4 of the 4 part Spartan Race Survival Series. This is part 4 of the 4 part Spartan Race Survival series. It’s way different from the last post. 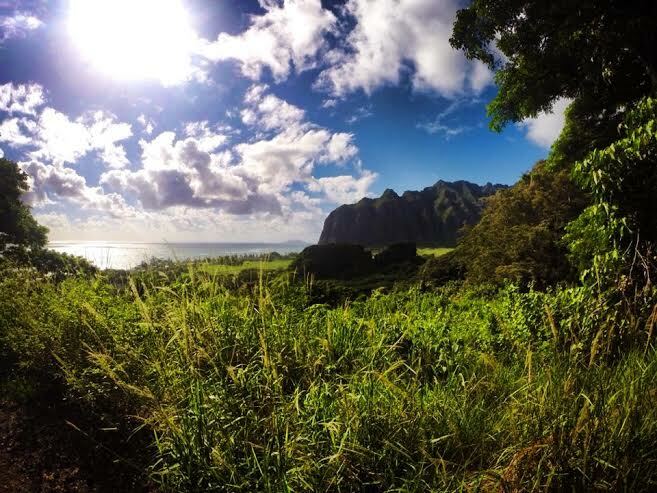 By seeing many of these pictures you would think it was just a wonderful beautiful day at Kualoa Ranch. And yes, that’s what it was in part. The other portion was survival of a 13+ mile race with over 25+ Obstacles. My number is 790. 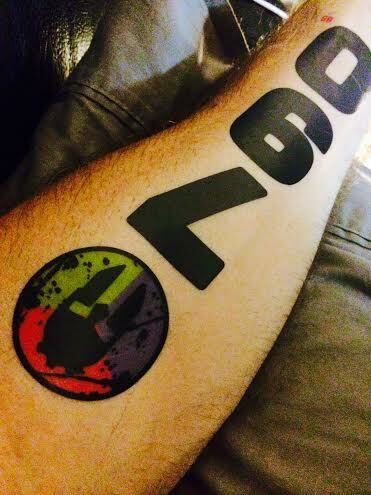 I don’t know if I put this tattoo is in the correct spot. But it seems to fit here very nicely and looks quite stunning. This man had NO Shoes on! The Finish-James completed all 3 races and did the Trifecta. In the middle are the 3 medals connecting to each other. I Finished Saturday’s Spartan Beast Race. James posing after completing all 3 races!!! The Green, The Red and The blue form one big medal. Scott/Me Finished the Beast in about 8 Hours and 40 Minutes. Wow, Whew, Yah! 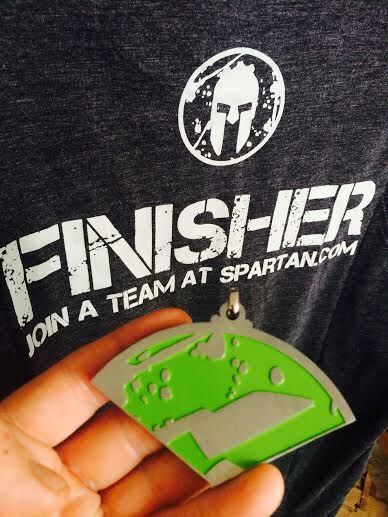 This is the Finisher T-Shirt from the Spartan Race in Hawaii on August 16, 2014. Also shown is the BEAST medal. I guess you need to do the Sprint and the Super to get the other 2 thirds of the medal. I swerved off the usual Fashion, Kicks and Lifestyle topics for the past few days to concetrate on the 2014 Spartan Race at Kualoa Ranch in Hawaii. I participated in the longest and most grueling race of the 3 choices entitled the BEAST. Good news is that today is Sunday, the race was Saturday and I’m Alive. I may joke around a bit on streetzblog, but this race was no JOKE! I did try to prepare, I trained for 7 weeks going from the number 1 incline on the tread mill to number 9. I also ate a bit more tuna fish, chicken and vegetables than usual, and thought I read enough prior to be prepared. 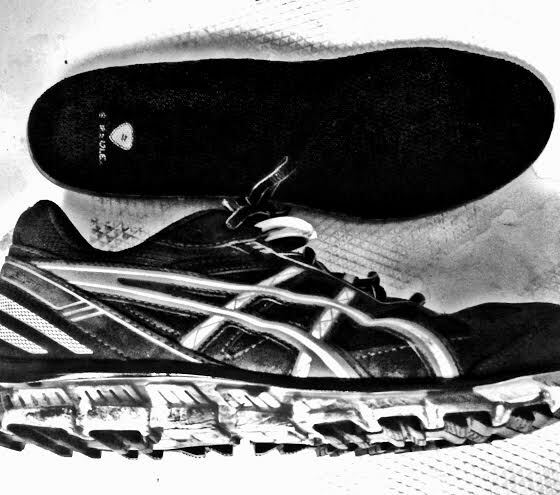 I actually didn’t wear my Air Jordans and picked up a pair of Asics Lows with ultra grip especially made for mud. I’m not a fan of running shoes, especially since they aren’t hi-tops. Although mine had a bit of fashion forwardness with the camo outersole. And of course, I bought the Black and Grey version. The Kicks I wore for the 2014 Spartan Race in Hawaii 2014. Asics-Black, Grey, Silver, Camo outer Sole. I didn’t prepare enough. I was pretty off, this was one of, if not the hardest thing I’ve ever, ever done in my whole entire life. I’m not a 22 year old in the military, I’ve never done a charity walk, I do go to the gym 4x a week, but I really don’t work that hard there. My friend said it would be F-U-N. Thus, i said I’d do it. Do it I did. And glad to say I am here alive and well to write about it. To make this blog post easier to read, I think I’ll just list the time-line with bullet points. As always keeping things postive, yet there maybe a bit of (spoiler alert) negative in here, but not really negative stuff, just some facts. Pre Race Breakfast: I had some coffee, a few sips of water, 1 piece of grilled chicken and a Gatorade goo pack. This was absolutely wrong. Tip 1: I recommend eating carbs for 3 days prior and having a Big breakfast the day of the race with eggs, toast, hash browns, coffee, and gatorade goop. I was starving after the first 20 minutes! First 2 hours: This was fun, walking, jogging, hanging with my friend and meeting some really nice, cool, friendly people. Best quote from this portion was from a co-participant named Jamal. He said, You Paid good money to do this. That was early on when it just seemed hard, a bit challenging yet very doable. I actually got really excited when I jumped over some super tall wall and made it without getting hurt. Next hour or so: I don’t remember all 25 obstacles but I sure remember this one. Check this out! They give you a BIG bucket, you are told to fill it with sharp grey ROCKS, that takes about 10 minutes to fill up. Then you carry it up a hill then down the hill. My brain thought it was crazy watching the others do it. Come to find out this was what I was best at. Go figure. I left this challenge smiling and psyched. Memorization: This was really funny to me. In the middle of all the chaos of surviving the elements, we needed to look on a big poster, find the last 2 digits of our race tattoo number and then memorize the saying next to it. I will remember mine for the rest of my life: Yankee 384-7893. They said that you needed to remember this to tell it to someone later in the race or you needed to do 30 burpees. BTW: No one ever asked us to repeat the number. But good thing is for about a half hour it kept me in a meditative state repeating the number over and over, a nice distraction so that I didn’t notice the pain, hunger and thirst. Next segment: We walked up a super slick, brownish-red mud path that was about 1 foot wide. We were going up, the fast people were coming down. This is where it gets funny. I would ask peple if we were almost over the hill. They would say all sorts of things like. Yes, the water is a half mile away, No You have a loooong way to go, and Oh its about 5 miles until you get back here. And the most outrageous comment came frrom a volunteer who said. Oh, just run to the top, the bottom has a nice waterfall with a water station. There was no waterfall and this is the part that really sucked, the guy at the water station, said he was OUT of water! O-U-T of water, Wow, luckily he gave me two sips of his own water bottle. Tip 2: Take complete control of your life and your circumstances. It’s hard to realize how true this is, but you and I are where we are due to what we have done, not what people have done to us. Bring your own water. After that water mishap: I am 99% sure I went the wrong way and got lost. My friend dissapeared and so did I. It’s like Vegas-No clocks. I have no idea how long i followed the wrong pack. But it felt like 20 minutes? 45 minutes? whatever it was, not good. I never saw my friend in the race again. So: I was Alone, trucking through weeds, mud, then some really awesome cool greyish green fern area appeared that felt just like a King Arthur or Lord of the Rings movie. I actually sat down and enjoyed the view and feeling of being somewhere wonderful. This was my favorite part of the whole day, it was just plain awesomeness. Next hour or 2 or 3? We walked through not around but through a creek bed. This area had brown water, big huge boulders, little rocks, more gushing water, sillpery slopes and mosquitos. It was here, I wanted to go home, but once you’re in a Spartan Race, there doesn’t seem to be any other way to go except thorough the race. So I did, I personally only received one cut on my hand. But I saw some very nasty wipe-outs. Sure hope no one cracked a skull. There is no one around to help other than the fellow racers. So, yes this was quite scary. Finally out of the creek: Found a volunteer who should have had water, he said he was just hanging around and had no water. I had cotton mouth at this point. Was so hungry, so thirsty and feet started to hurt. Tip 3: Bring 5-6 of those gatorade goops with you on the race and if you’re back doesnt hurt too bad, get a hydration pack filled with ice. So in case you are slow like me, you don’t have to rely on the water stations that were out of water. The Walk: I walked, I walked, I talked a little to some nice, friendly people and some unfriendly grumps who kept complaining about not having any water. That can be easy to do, but I’ve been working on my mind not to complain, condemn or criticize. When the criticizing thoughts came up about the water I changed my thoughts. The 2 mantras I interchanged were I love my life and Peace, Love and Happiness. This walk went on and on and on. Then we ran into another obstacle. This is where it was fun again. I looked at the tall wall like WTF, How am I going to jump over that very tall massive piece of wood? Well you never know what you can do until you try. I just ran at it grabbed the top and jumped over. Amazing! Tip 4: You never know if you can do something until you try to do it. Just do it, or at least try to do it, you will succeed. Water: We finally found some water. A big barrel of ice. I ate this and brought some along. The ice woke me up more than a morning cup of joe. I never knew how much a body really needs water and food. I felt great going back up the muddy hill we had traversed a few hours earlier. With the ice water I was rejuvenated and felt good… well until I ran out. Miles: Over the next 20-50 minutes I asked all the volunteers I could find how far is it until the finish? Even though we were moving forward, we all received the exact same similar answers. I remember the answers to a T: About 3.5 miles, 3 and a half miles, a little over 3 miles and less than 3 miles. It became a joke amongst our little group of travelers. Like I said, it’s like Vegas here-No clocks. And no real information, hey maybe that’s what it was like in Sparta? It’s like you’re in the Twilight Zone. The Question: With around 3 miles or so to go, the 5 of us were asked a question by someone who I think was a Medic. He asked us If we were seeing any spots? I saw the Ranch spin, I could barely walk, I needed some food, and I was hurting all over. But no spots in my view, so I told him No. The other 4 participants also said No, so we continued on towards the finish line. I guess it’s all good if you aren’t seeing any spots! Delirum Walk: After coming down from the hill, we had another super long walk through dirt and grass. My feet felt like pain encased in lead gym shoes. If someone drove by and asked me if I wanted a ride, I would have said Hell Yeah. But, I heard one of my favorite things, music! So I sang along to some Calvin Harris Feels so Good and one of my all time favs, Guns & Roses Welcome to the Jungle. This got me about 20 minutes further towards the finish. YAH! I also bumped into 4 people I’d been seeing here and there thorughout. Was able to chat with them a bit, they were very nice and helped me push through the pains. I also saw another guy with a very hurt knee, who every time I was about give up. He would appear and I’d chat with him long enough to keep us both on track. I think if you don’t talk to fellow racers or have a some sort of spiritual practice, this race would be even tougher. I’m pretty good at postive thinking and mantras so it helped. Tip 5: Stay positive no matter what happens, repeat a mantra or 2 when things get you down. Concentrating on a mantra keeps the monkey mind away and keeps you focused, relaxed and moving towards your goal centered and on track. Best Banana Ever: With only 2 miles to go. I thought a medic was going to take me away. Instead his buddy handed me half of a banana and said to finish up the race. He gave the other half to my new friend with the hurt knee. I ate my banana. It was the best tasting banana ever. And it gave me a hope and a real skip and a jump in my stride. Unbelievable, Amazing, Crazy. Food works. Tip 6: in the race and in the real world, pay attention to the trainers and doctors and eat every 3-4 hours, food is really much better energy than Caffeine. Obstacle: After the Banana I was able to carry a very heavy rock down the road, then do 5 burpees and return the rock. Thank You very much to the Man with the Banana. Spear Throw: This is one of the last 3 obstacles. Here you are given a spear and told to throw it into the hay and make it stick. The boss man at this was the strictest of the day. He wouldn’t let any of us leave until we did it. Which sounded outrageous but turned out to be pretty cool. 18 throws later and a special technique, I made it. It gave me a great big smile and the energy needed to go up and over some big wood structure, then jump over a fire and under the beeping timers table. All Done. I started at 8:20 a.m and finished at about 5:15 p.m. At the finish I ate 4 bananas, had some ice water, coconut juice, received a nice shirt in my favorite color and a third of a Flo-Green medal. Whew! Now it’s back to shopping, finding fun fashion and some more stories on KIcks. Spartan in the Mud! Yep that’s me in the grey shirt and orange shorts. Will I do this again? I don’t know. The pain today is pretty excruciating. And like I said at the beginning of this post, I truly am glad to be alive. No joking around. My heart was pounding hard, it was a bit dangerous out there, but I have a huge feeling of great accomplishment. Tip 7: I was able to do this race and survive. If you put your mind to any project you may think up, it’s all possible. And I suspect it will be much easier to accomplish some of my dreams much quicker and easier after a grueling race like this. I also suspect things I thought were big deals at work will seem much smaller after completing a race like this. Glad to say, I’ll see you on the CITY Streetz this week. Have a Great Week! With just 6 hours before i need to wake up for my first Spartan Race and just 9 hours from the race itself. I figured I’d let you know some tips I learned before the first day of racing..or for me walking, jumping, and getting very muddy. Sign Up Early: In Hawaii that would be to sign up in April. Cost is only $119 compared to $230 the week of the race. So, about 5-6 months prior to your race is a good time to sign up. Sign up for the correct Race: It’s so crazy confusing. 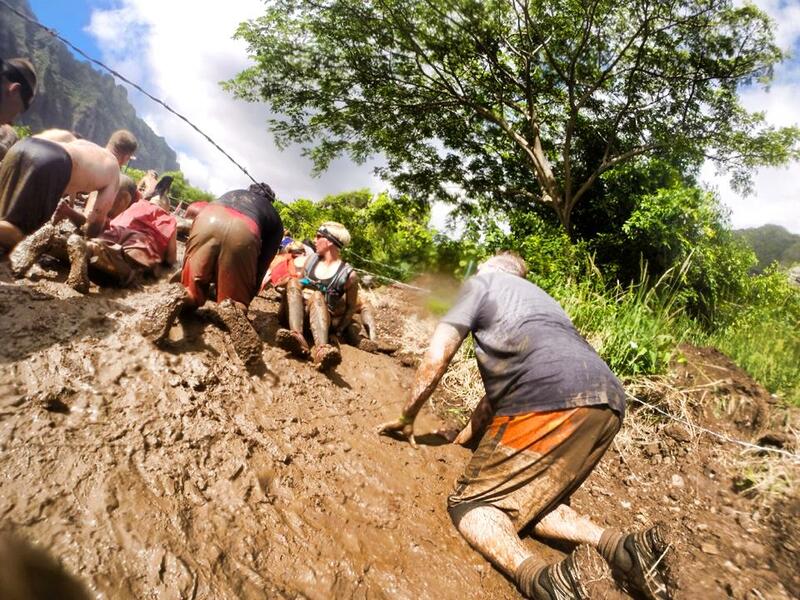 There are basically 3 races all with their own name, number of miles and number of obstacles. I just signed up with my friend and come to find out we are doing ALL three! Here’s a little snipet of how confusing it can be: Sprint, Super, Beast, Trifecta, Spartan Race, Saturday, Sunday, Challenge, Individual, Tribe even Ultimate Spartan Trifecta Challenge is all one big word. I think I have it figured out what it all means today, but it took me a few weeks to finally realize the lingo. Set a Budget: You’ll need some supplies from a place like Sports Authority. Some things include: Cushioned socks, special kicks with grip that let the water out easily, sport sun tan spray, light shorts-I’m wearing some Jordan’s one day and some old surf shorts another, man made material T’s-I may try one of these Sunday, for Saturday, I’ll be Rockin’ a Grey, Orange and Silver Streetzblog shirt, a hat, some sunglasses, carbo gel, knee protectors, arm sleeves, protein or carb bars, tight medium length sports underwear and maybe even a couple other things I have yet to learn about. You can buy em’ all or just some. I suggest choosing a dollar amount prior to shopping, then buying what you absolutely think you may need. You can always come back Saturday night and get some more of this slightly ill fashionable garb. Train and Rest: Upper body strength, Endurance and legs seem to be most important. And 3 days before, take it easy, jacuzzi it up a bit and relax. Sleep: Yep, probably not the best tip is to write a blog a few hours before a race like this. For me, it takes me out of my head and relaxes my mind. Keeping me focused on entertaining and helping you and not thinking of my aching knee or how in the outrageous world am I gonna’ wake up at 5 a.m. I can stay awake until 5 a.m easily. Waking up then, Wow! 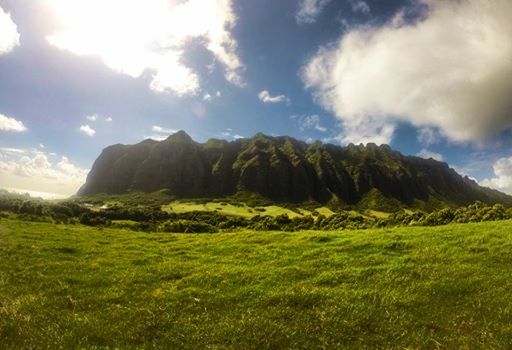 See you on the Streetz of the Kualoa Ranch ..where they filmed Jurassic Park and close to where they filmed Fantasy Island on the island of Oahu, Then at the Arts in Motion Car show at Aloha Stadium, and back to the Spartan Race for day two on Sunday. I’ll let you know if I find some new tips on Saturday. Have a nice weekend! BTW: I hear Michael Phelps is in town this weekend. Either he’s filming a spot or promoting the Aquasphere brand or both. Hope to bump into him…Hey maybe he’ll be one of the celebs at the Spartan Race, now that would be fun!